Squidoo blocks Technorati and other robots from crawling Squidoo RSS feeds through their robots.txt settings. 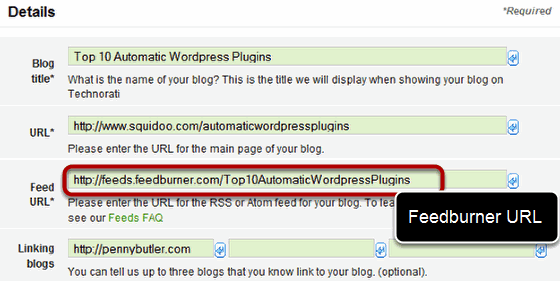 However, Google Feedburner allows you to get past that. And here I show you step-by-step how to do it. 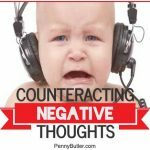 View more presentations from Penny Butler. Your lens must be published first for this to work. So go create a lens on Squidoo, and then once it’s published, come back here. Next, go to your published page, and copy the URL. 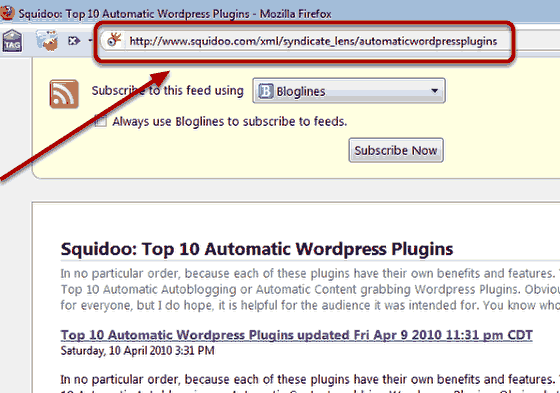 For example, I would copy http://www.squidoo.com/automaticwordpressplugins and paste it into Notepad. Click on the little orange & white RSS icon at the top of your lens. 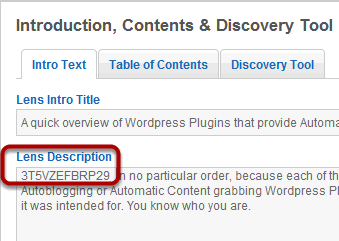 A new page will popup – copy the url, as per below image. You’ll need this as well for Technorati. So I will copy http://www.squidoo.com/xml/syndicate_lens/automaticwordpressplugins to my notepad. Next, we need to head over to Feedburner and “Burn our Feed”. 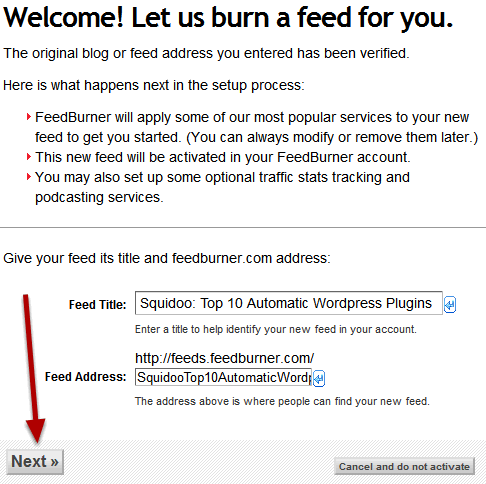 So sign into http://feedburner.google.com with your gmail account and you will se the box “Burn a feed right this instant“. Paste in your Squidoo RSS feed into there. So I will type in http://www.squidoo.com/xml/syndicate_lens/automaticwordpressplugins and then click on Next. You can change the Title and Address if you like, and once you are happy, click on Next. 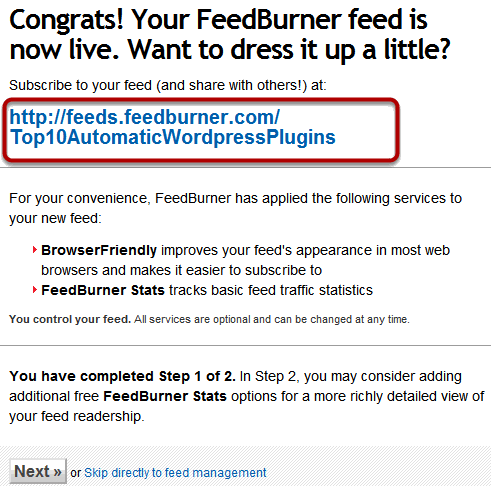 Copy your new Feedburner RSS URL into Notepad, (so in my example, I would copy http://feeds.feedburner.com/Top10AutomaticWordpressPlugins into notepad) then keep clicking Next, Next, Next.. etc.. to setup your Feed. Once you reach the page that says “Your feed is ready for the world“, you are done with this section. So in my notepad, I should now have.. 1.) Squidoo Public Lens URL, 2.) Squidoo RSS URL (which we no longer need) and 3.) Google Feedburner URL. Head over to the Technorati website http://technorati.com and sign in. 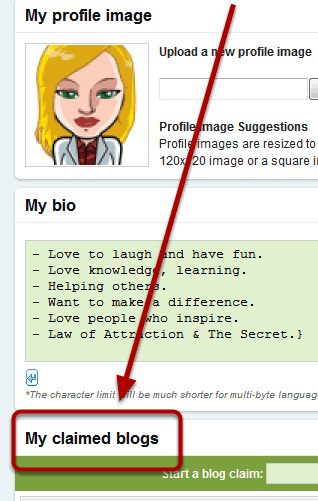 Once you see your profile, scroll down the bottom of the page, until you see MyClaimedBlogs. 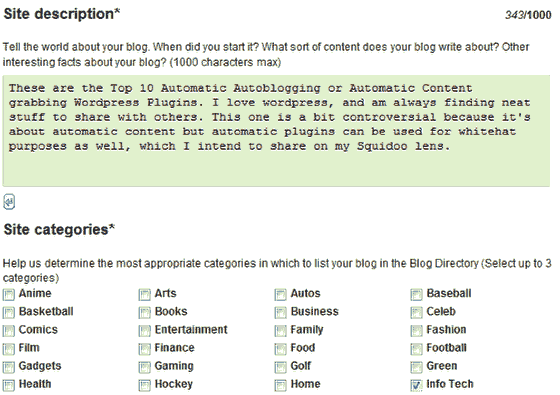 Here it is asking you for the details of your blog – in this case, the details of your Squidoo lens. Type in your lens description (in a human-friendly way), and pick up to 3 categories for your blog “lens” to be submitted to. 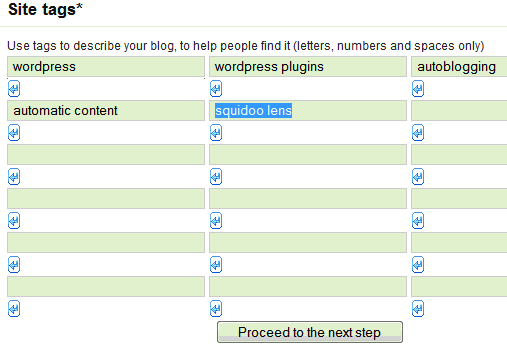 Add your site tags (keywords that match the content of your Squidoo lens), then click on Proceeed to the next step. Next, you are put in a queue. Today, Technorati are running very fast, but sometimes they can take hours/days, however today, I can just click on “Return to Profile” to go to the next step. 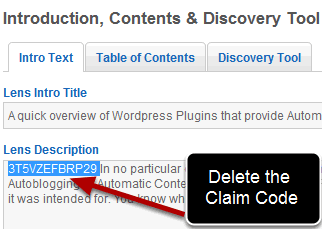 Scroll back down to My claimed blogs, and then click on the Check Claim button. Copy the code they have written on the claim status to your Notepad file. So in my example, I will copy the code “3T5VZEFBRP29” to notepad. Head back to Squidoo and go back into “Edit” mode of your lens. Click on Edit to edit the first module of your lens (it must be the first, as the first paragraph is the only thing that shows up in Google’s Feedburner). Paste the Technorati code (my example 3T5VZEFBRP29) into the start of the lens. Then click Save. 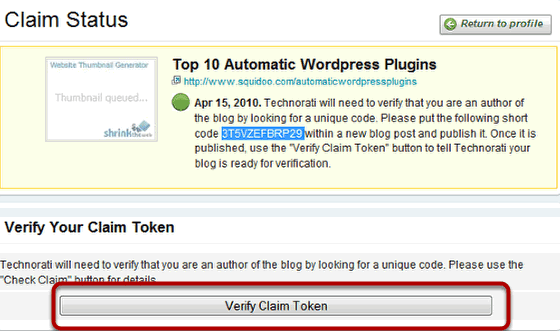 Now head back to Technorati and click on “Verify Claim Token”. It will report that it’s evaluating your claim. In the next 10 minutes or so, you should receive an email from them saying that it’s successfully crawled. You can also check this on your profile. Now that the lens has been successfully crawled, we can go back to our lens and remove the code. Go back to your Squidoo Lens, delete the Claim Code from your first module, save, and then click Publish again to restore your lens. Wait for Technorati to do their review. If you are successful, they will let you know via both the Profile page, and an email. Congratulations, your claim is now complete! Please allow 24 to 48 hours for Authority and recent posts to begin showing for your site now that it has been successfully claimed. 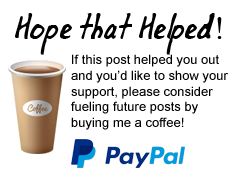 Once they are there, we will update your site’s Authority once per day. 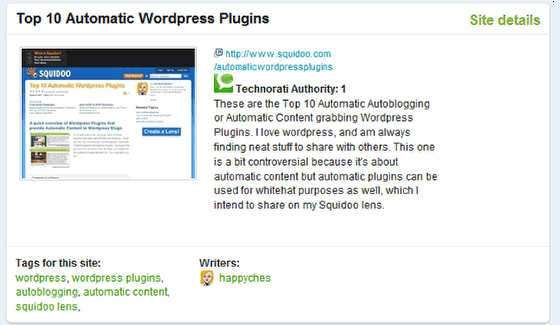 At first you may not see your site listed in the Technorati Blog Directory for all of the categories you’ve selected. As you write blog posts around those topics, you should see your Topical Authority in those categories begin to rise. And now your Squidoo lens has some “Technorati Love”. What’s so good about that? 2.) 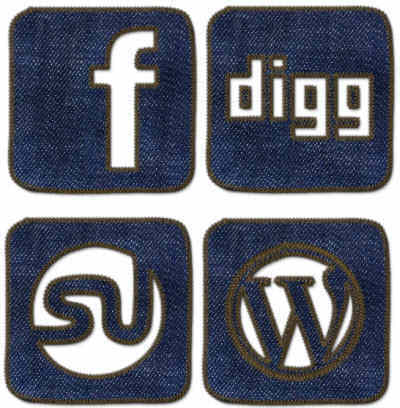 Technorati is a blog Search Engine / Directory and is the # 1 Blog Indexing service. Technorati – Top 100 Blogs as ranked by Technorati Authority – updated daily. Pretty great post. I simply stumbled upon your blog and wanted to say that I’ve truly loved browsing your posts. I think this method no longer works though, but then again the post is quite a few years old so what did I expect, but loving the rest of your site too, really cool blog. Wow, this is awesome, thank you! Thank you for the tutorial! I have a Technorati page and also Squidoo lenses but never thought of integrating them all! Great instructions. I’m going to give it a try. I’ll let you know how it goes. I looked at Amit’s comment/post. From the URL, I think the keywords/words contained in URL may raised a flag. 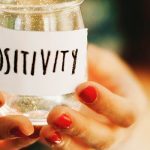 It may not be negative at all. Oh, odd post. I don’t know if my link will show that, but just to show you what I claim here for the first time in Tecnorati. I don’t know what was wrong with others. I followed your steps here. Everything is good. I got Technorati Auth of 93 which is shown on my link. Hi, Penny. I am glad that I found your post here. I am trying to follow your steps here. It seems like Technorati has lots of submissions. I have to wait. I could use an input: Do you submit more than one lens per day or just one? in address bar I get no any feed . Bugger.. I haven’t had a new squidoo page to test with, but going by the couple of responses lately, it seems like it doesn’t work anymore. I really want to try it again, but I’m really busy right now. 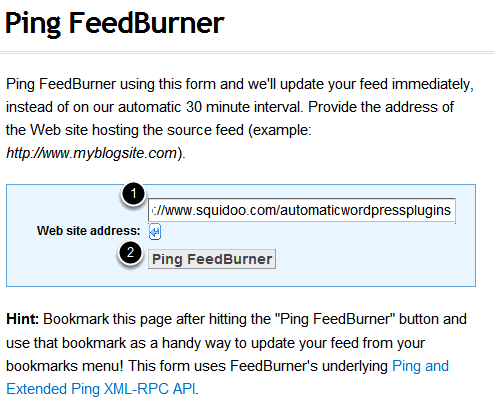 What is coming to mind is that there might be other feed creators like feedburner that we can use as an alternative. 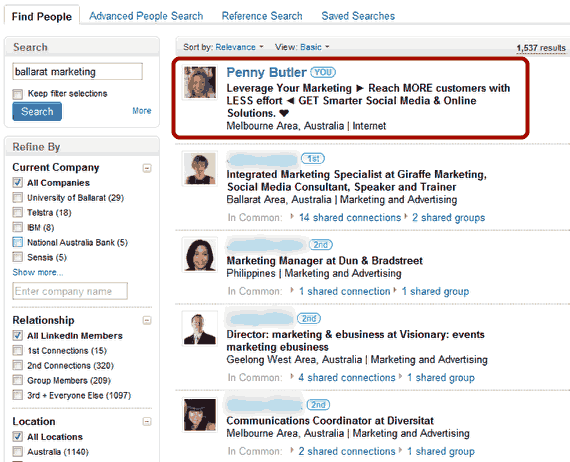 Hi Penny, thank you for the wonderful detail step by step instructions on how to add Squidoo to Technorati. Your instructions are clear and concise. Penny, as Cynergy Diva has indicated, Technorati doesn’t see my code. I have followed your directions to the T.
Thank you for the detailed explanation on how to make this work. I am looking forward to trying this in the near future for a Squidoo Lens that I am working on. Keep up the fantastic advice. Really? I did this the same day that I posted, for 2 separate squidoo lenses (4 days ago).. what error are you getting? I hope they haven’t cottoned onto it from my post lol.. Else, is it just saying something about your code? or is it just not accepting feedburner feeds?